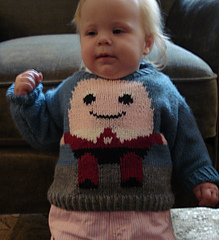 This is one of a series of nursery rhyme sweaters to knit, with the design on the front and back of each sweater. (Others are Cow Jumped Over the Moon, Owl and the Pussycat, and The Queen of Hearts.) 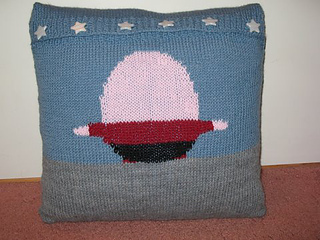 Easy to follow full color stitch charts are provided for front and back of sweater, and there are instructions for changing yarn colors for the intarsia design. 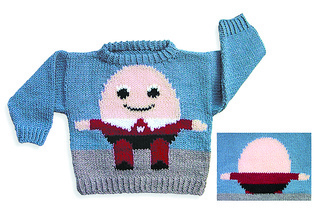 Because of its symmetric design, Humpty Dumpty is an easy intarsia pattern to work. 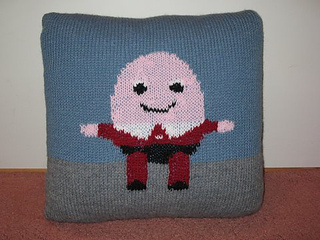 If you haven’t tried intarsia before, this is a good place to start! Stocking stitch is used throughout. DK or worsted weight wool or cotton yarn.